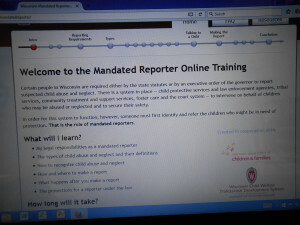 Visit the Department of Children and Families’ website for more information regarding Certification. Thank you for all you’ve done to make this process clear for us. Without you we would have felt as if we were left to fend for ourselves with brick walls, frustration, confusion, red tape and no leadership from you. 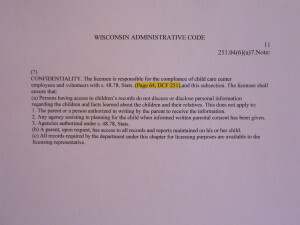 Thank goodness for Supporting Families Together Association through the [Wisconsin Department of Children and Families]. 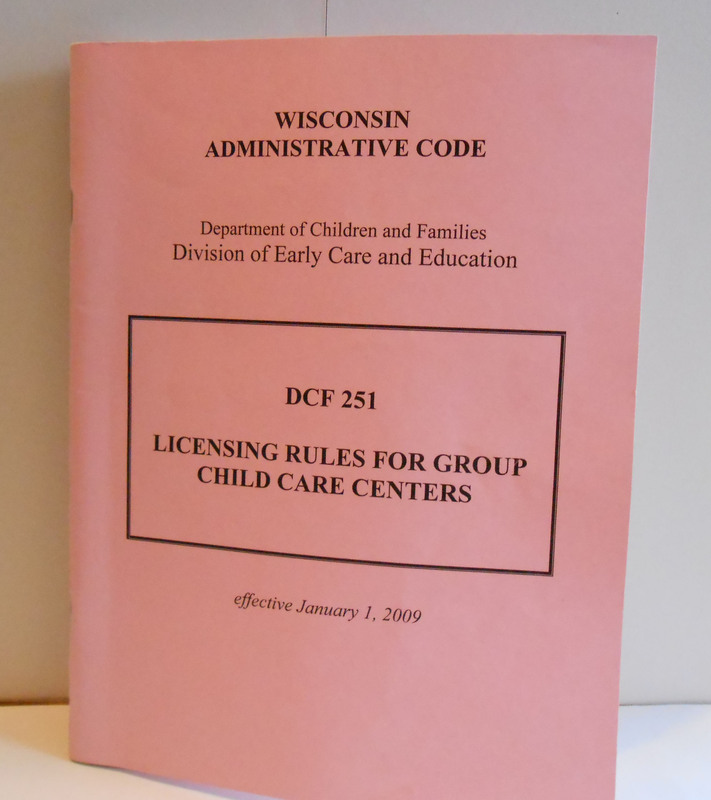 In Wisconsin, a family child care license is required if you are going to care for four or more children under the age of 7 years who are not related to the provider. 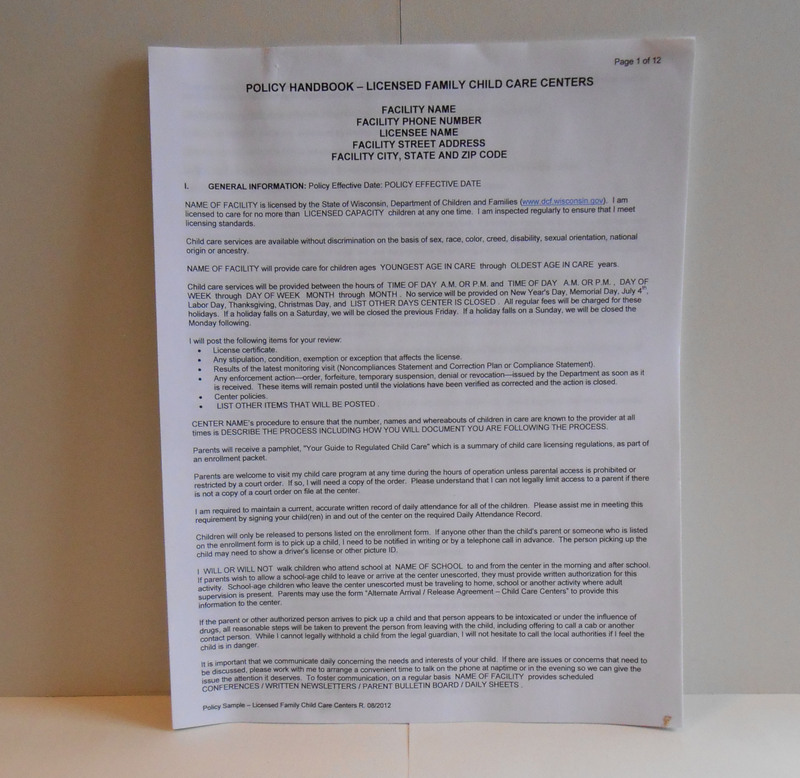 A licensed family child care provider is limited to caring for no more than eight children at any one time. Many resources are available from a variety of agencies, to assist you in exploring this career option and in preparing to apply for a license. 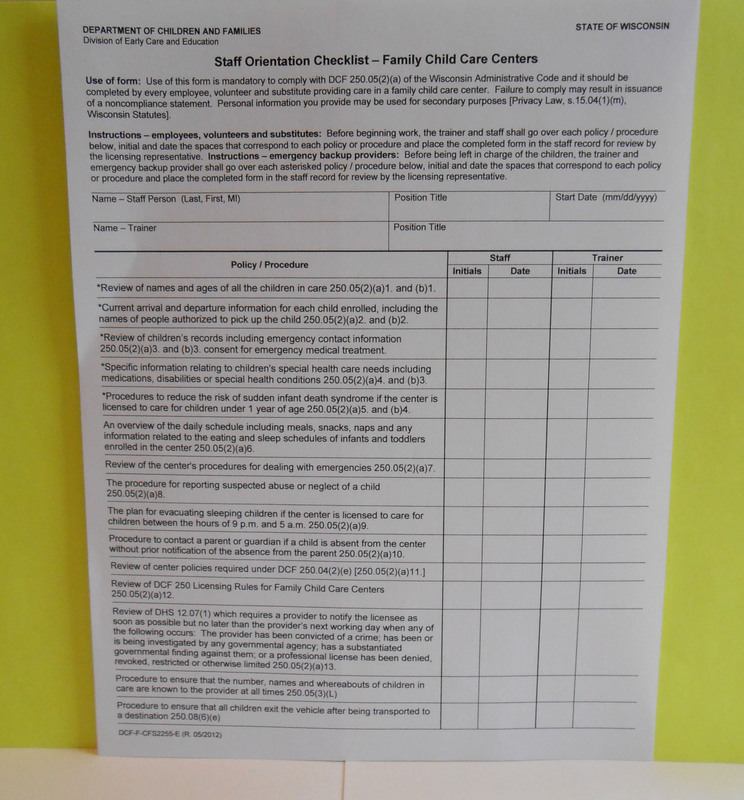 Access the Family Child Care Initial Licensing Checklist under “Family Child Care Resources” below. 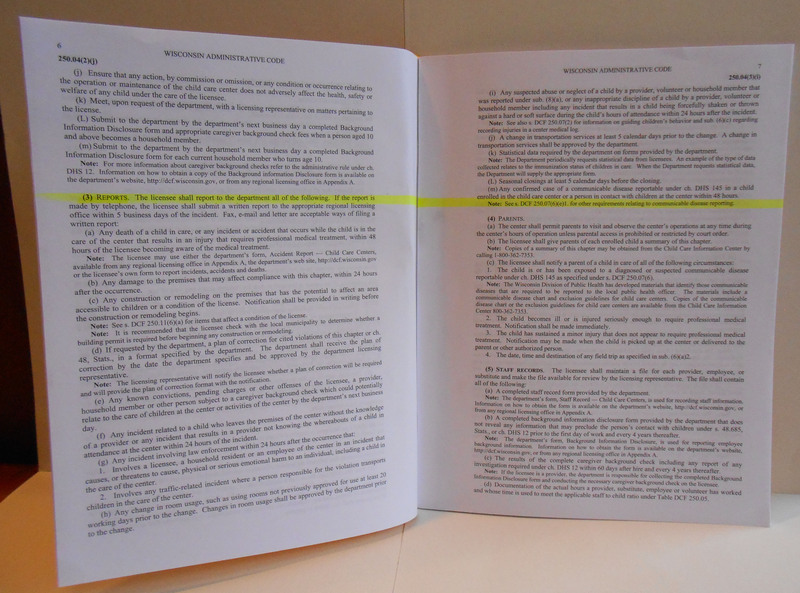 250.04(2)(a): COMPLIANCE WITH LAWS. The licensee understands that the entity must maintain compliance with all laws governing the facility and its operation. 250.04(2)(e): SUBMIT, IMPLEMENT & PROVIDE POLICIES TO PARENTS. 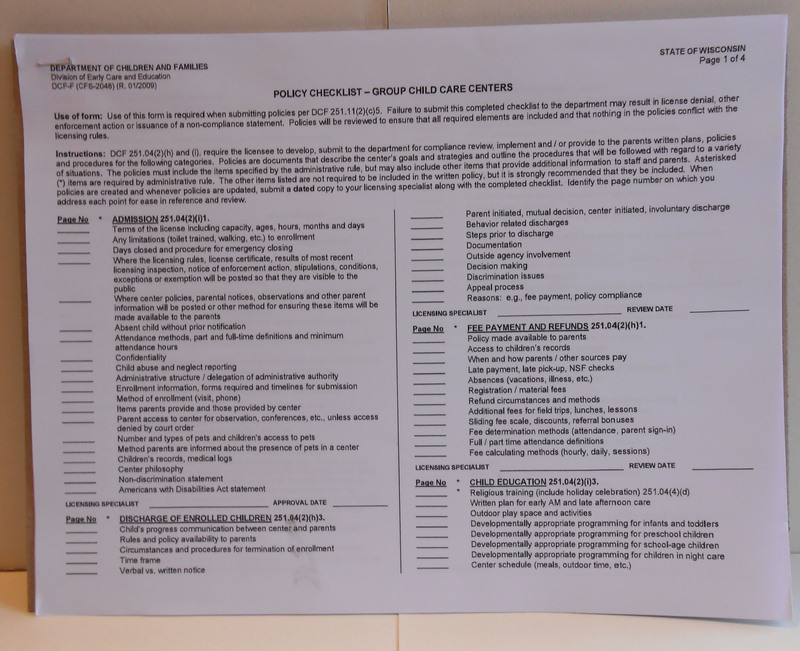 The center’s policies and procedures contain all the required items identified in the licensing rule and on the policy review checklist. 250.04(2)(f): ADMINISTRATION–STAFF ORIENTATION PLAN. 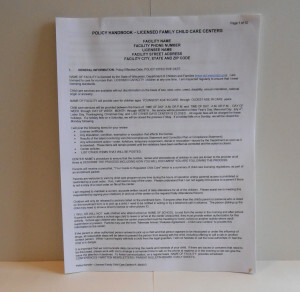 The licensee has developed and submitted for approval, an orientation plan for any employees, substitutes and emergency back-up providers, which covers all items described in DCF 25.05(2)(a) and (b). 250.04(3): WRITTEN REPORT TO THE DEPARTMENT. 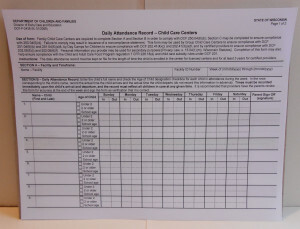 The licensee has reviewed DCF 250.04(3) and is aware of when reports to the department are required. 250.04(4)(c): PARENT NOTIFICATIONS. 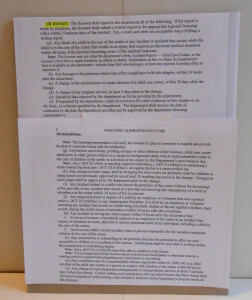 The licensee has reviewed 250.04(4)(c) and is aware that they shall notify the parents of a child in care when the child is or has been exposed to a diagnosed or suspected communicable disease, when the child becomes ill or is injured seriously enough to require professional medical treatment, when the child has sustained a minor injury, and of the date, time and destination of any field trip. 250.04(5): STAFF FILE– MAINTENANCE AND AVAILABILITY. 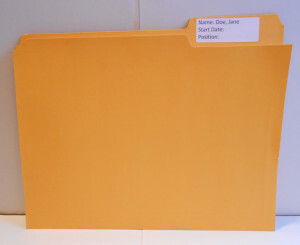 The licensee understands that a file must be maintained for each provider, employee or substitute per DCF 250.04(5)(a) through (k) and understands that the file must be available for review by the licensing specialist. 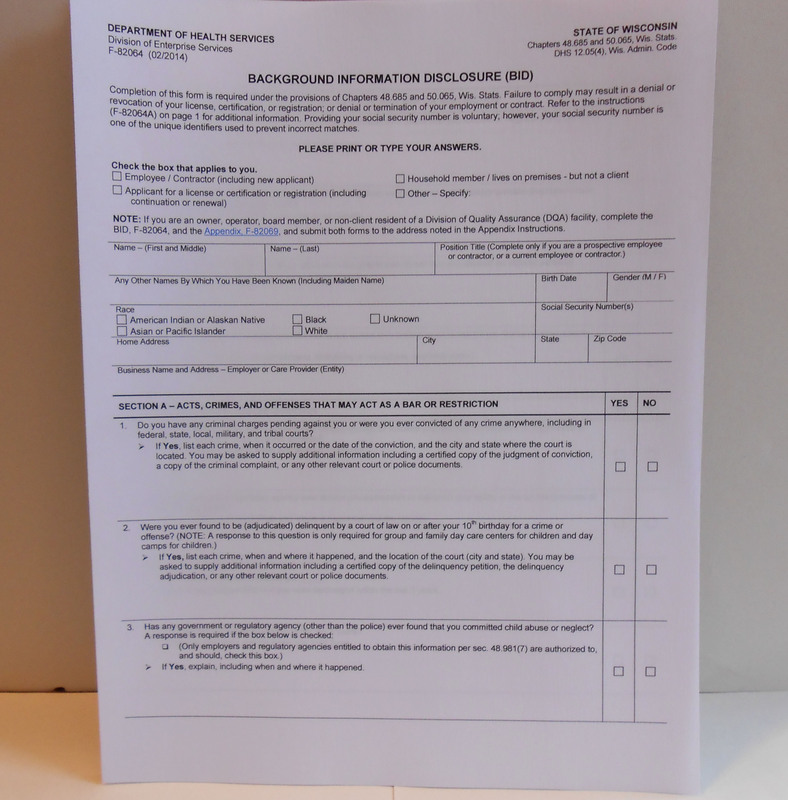 250.04(5)(a): STAFF FILE– STAFF RECORD FORM. 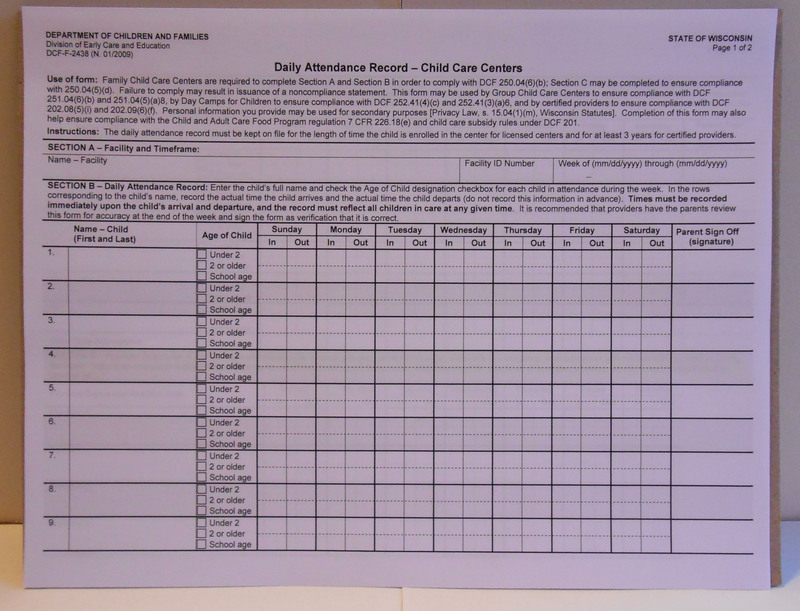 There is a completed department form, Staff Record-Child Care Centers, for each provider, employee or substitute. 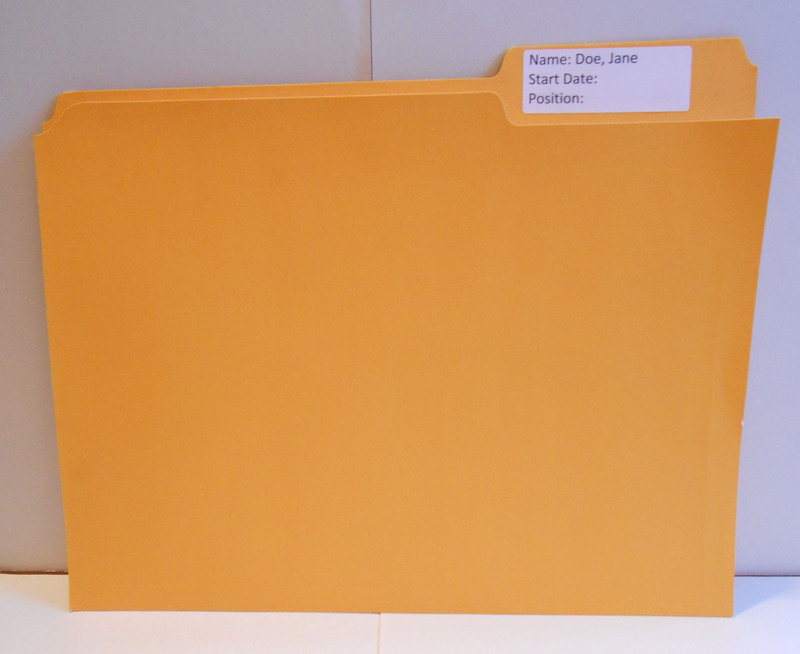 250.04(5)(b): STAFF FILE– BACKGROUND INFORMATION DISCLOSURE FORM. 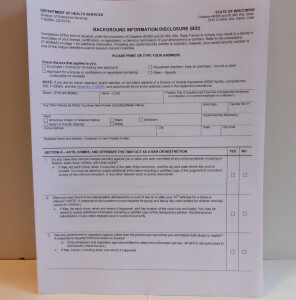 There is a completed department form, Background Information Disclosure, for each provider, employee or substitute. Note: The BID form for the licensee shall be submitted to the department with the application materials. 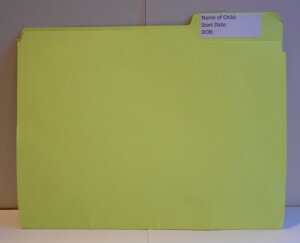 250.04(5)(d): STAFF FILE– DAYS, HOURS WORKED. 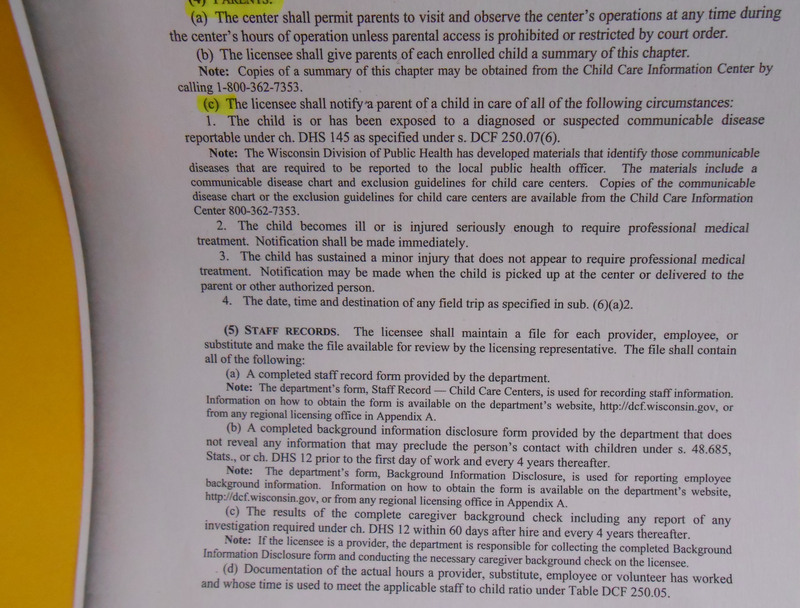 The licensee has a procedure for recording all actual hours a provider (including the licensee), substitute, employee or volunteer has worked and whose time is used to meet the applicable staff-to-child ratio under Table DCF 250.05. 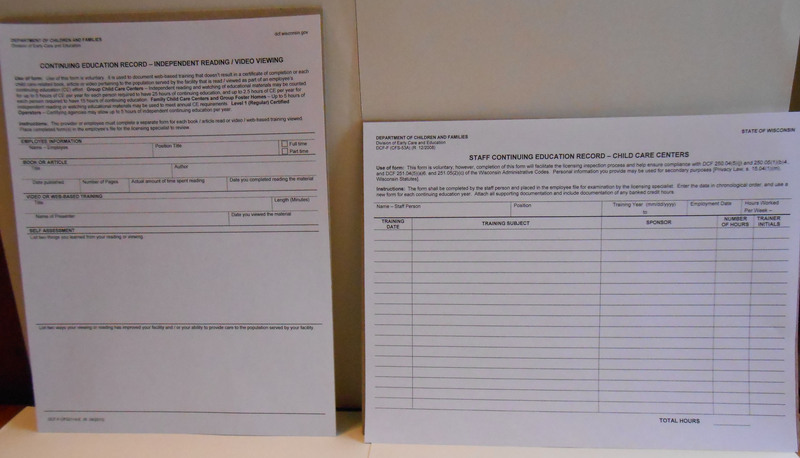 250.04(5)(e): STAFF FILE– PHYSICAL EXAMINATION FORM. 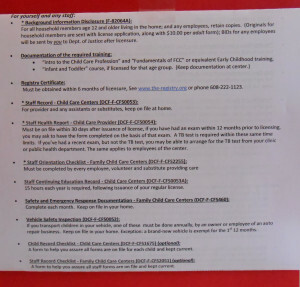 There is a physical examination report on the department’s form, Staff Health Report- Child Care Centers, for each provider, employee or substitute. 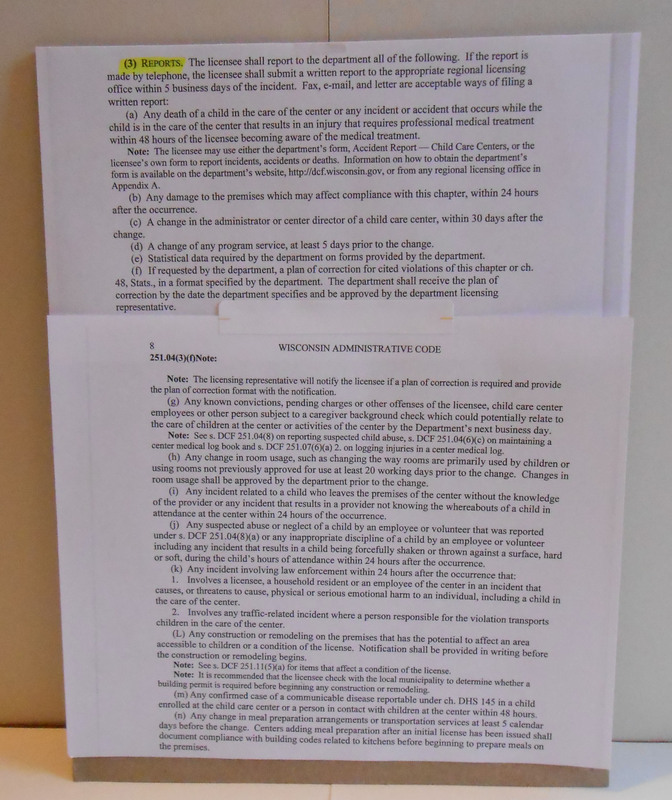 The report has been dated and signed by a licensed physician, physician’s assistant or HealthCheck provider, and it indicates that the person is free from illness detrimental to children, including tuberculosis, and that the person is physically able to work with young children. 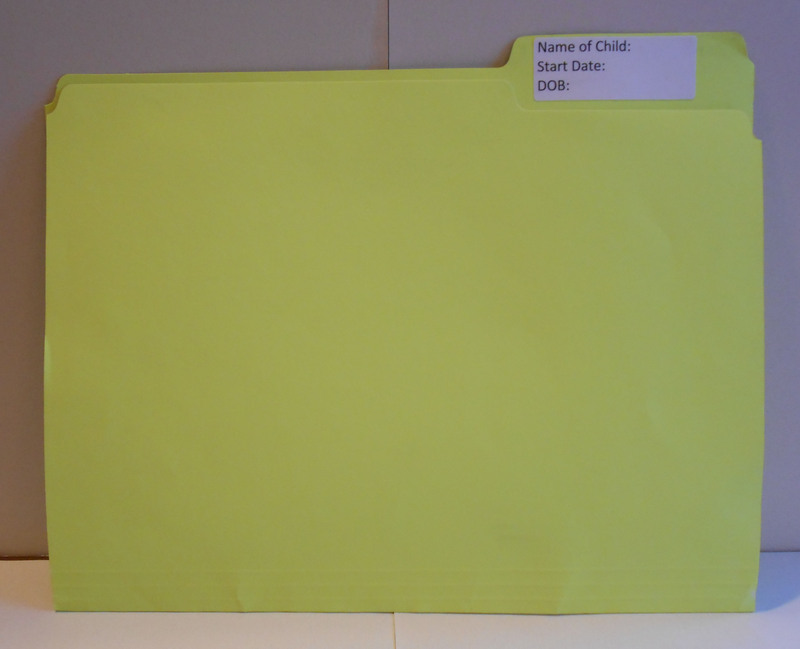 The report has been completed within 12 months prior to the date the person became licensed or began working with children. 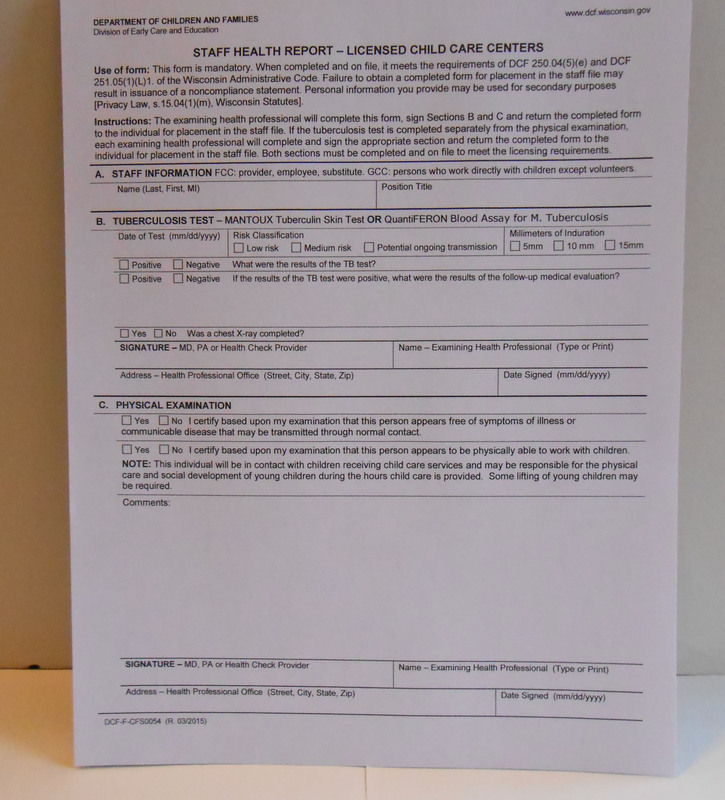 If not currently on file, this report must be obtained within 30 days after the date the person becomes licensed or begins working with children. 250.04(5)(k): STAFF FILE– REGISTRY CERTIFICATE. 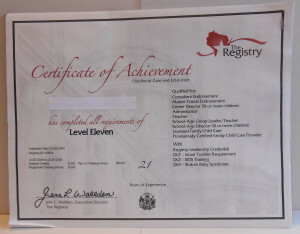 There is a certificate from The Registry for the licensee and each provider. 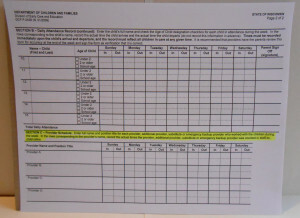 Substitutes are not required to have Registry certificate until they have worked for 240 hours. 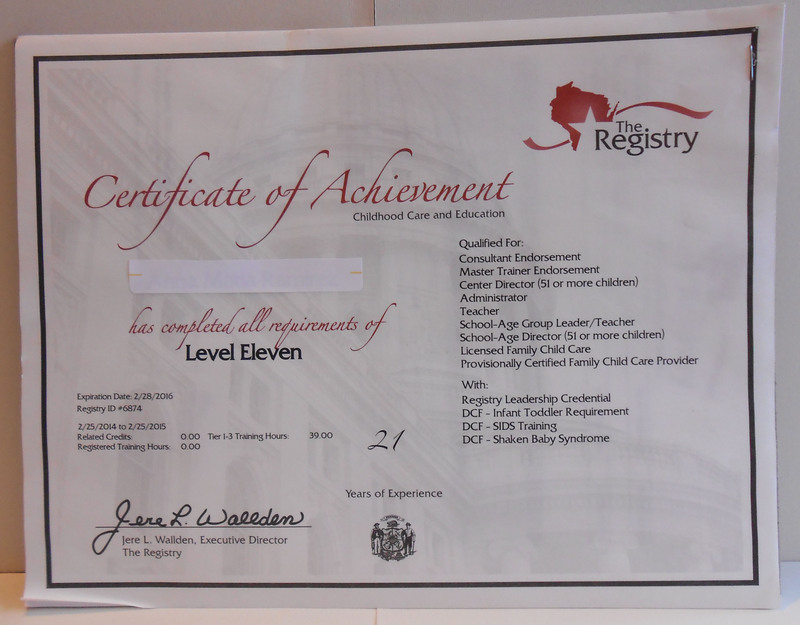 Note: A person has 6 months after becoming licensed or beginning to work with children to obtain a Registry certificate. 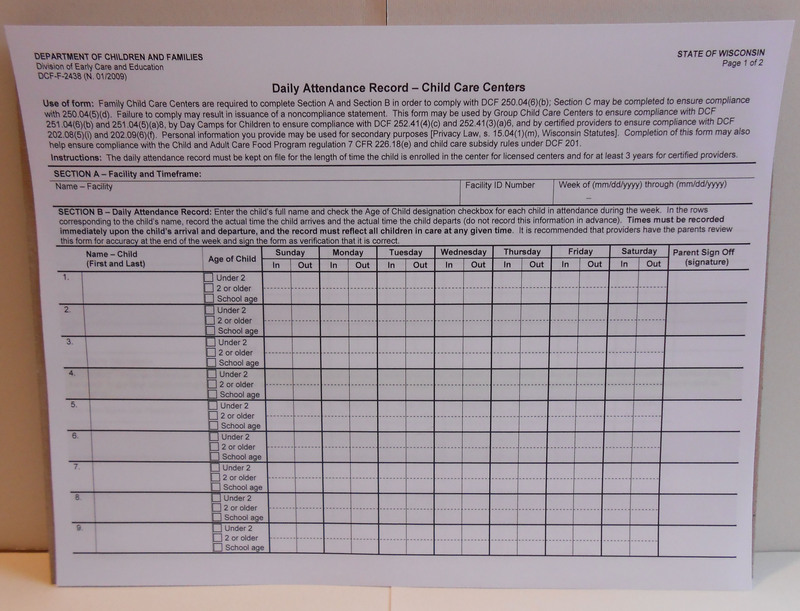 250.04(6)(b): CURRENT, ACCURATE DAILY ATTENDANCE RECORD. 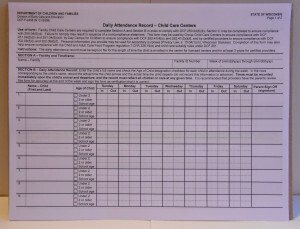 The licensee has a supply of the required form, Daily Attendance Records– Child Care Centers, on which to maintain a current, accurate written record of daily attendance. 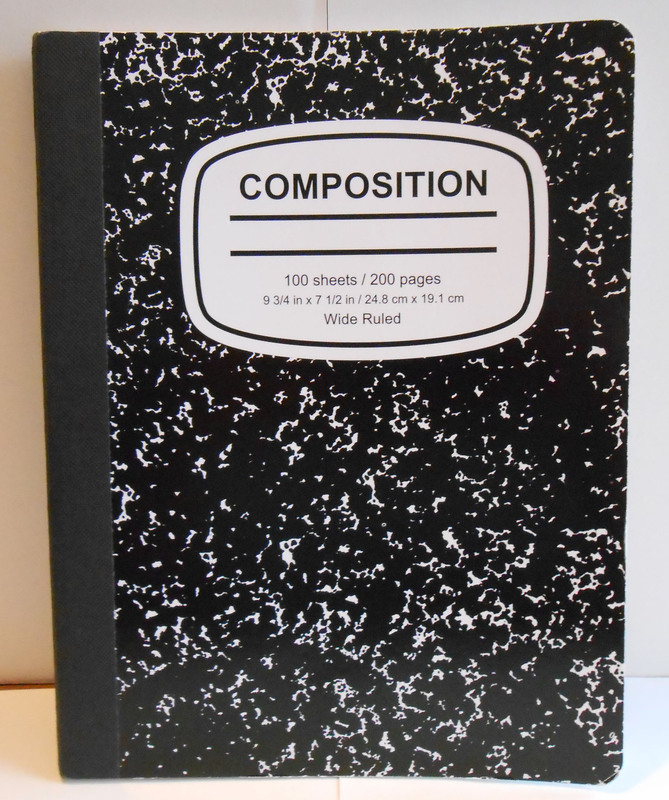 250.04(6)(c): MEDICAL LOG BOOK– MAINTENANCE. 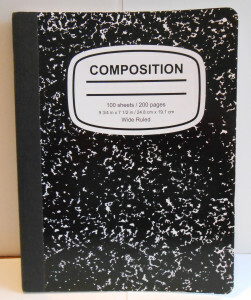 There is a medical log book present with pages that are lined and numbered and a stitched binding. 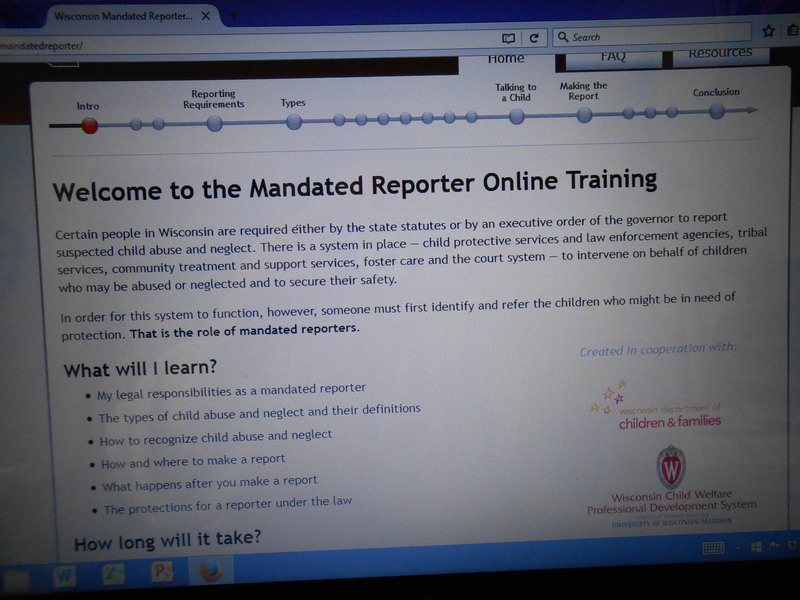 250.04(8)(a): CHILD ABUSE & NEGLECT– MANDATED REPORTING. The licensee understands that a provider who knows or has reasonable cause to suspect that a child has been abused or neglected as defined in ss.48.01(1) and 48.981(1), Stats., shall immediately contact the appropriate authorities. 250.04(8)(b): CHILD ABUSE & NEGLECT BIENNIAL TRAINING. 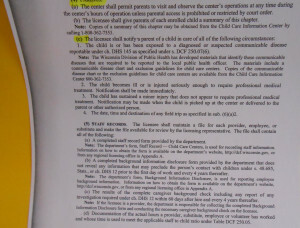 The licensee has a method for documenting that each provider and substitute has received training at least every two years in all of the following: child abuse and neglect laws; how to identify children who have been abused or neglected; the procedure for ensuring that all known or suspected cases of child abuse or neglect are immediately reported to the proper authorities. 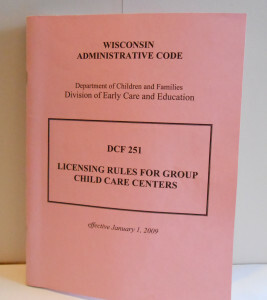 In Wisconsin, a group child care license is required to care for nine or more children for less than 24 hours a day. Many resources are available from a variety of agencies, to assist you in exploring this career option and in preparing to apply for a license. 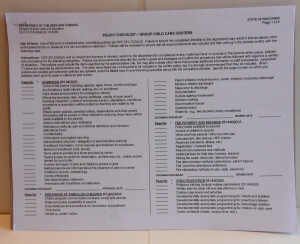 Access the Group Child Care Initial Licensing Checklist under “Group Child Care Resources” below. 251.04(2)(a): COMPLIANCE WITH LAWS The licensee understands that the entity must maintain compliance with all laws governing the facility and its operation. 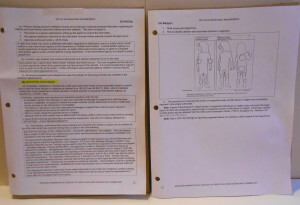 is completed and will be submitted to the licensing office with the policies. 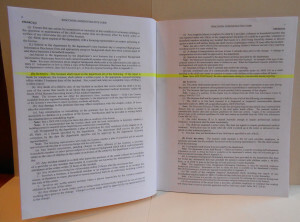 delegation of administrative authority will be submitted with the application materials. 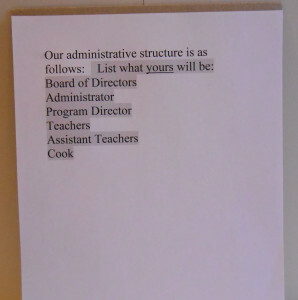 posted in an area of the center where parents will be likely to see it. 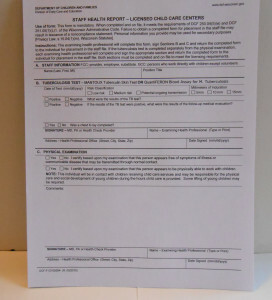 is available for examination by the licensing representative at the center, per DCF 251.04(5)(a)1. through 8.
and on file prior to a child’s first day of attendance. 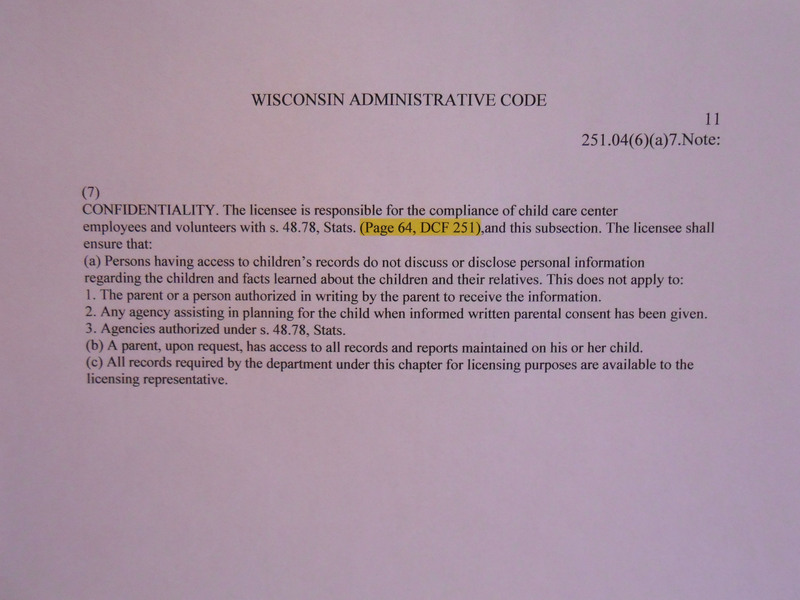 251.04(8)(a) & 251.04(8)(b)3:MANDATED REPORTING – CHILD ABUSE & NEGLECT. The licensee knows how to identify suspected child abuse and neglect and to whom it should be reported. 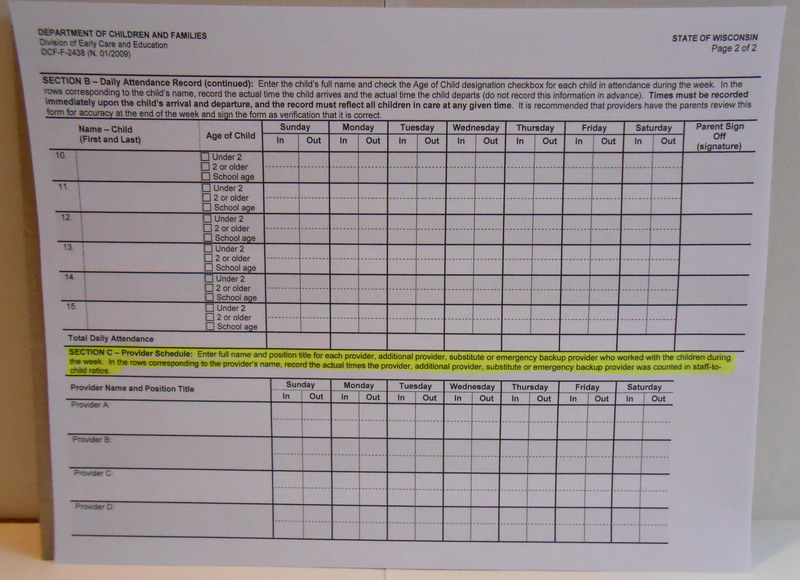 CHILD ABUSE & NEGLECT TRAINING – REPORTING PROCEDURE There is a procedure for ensuring that known or suspected cases of child abuse or neglect are immediately reported to the proper authorities. Still not sure? 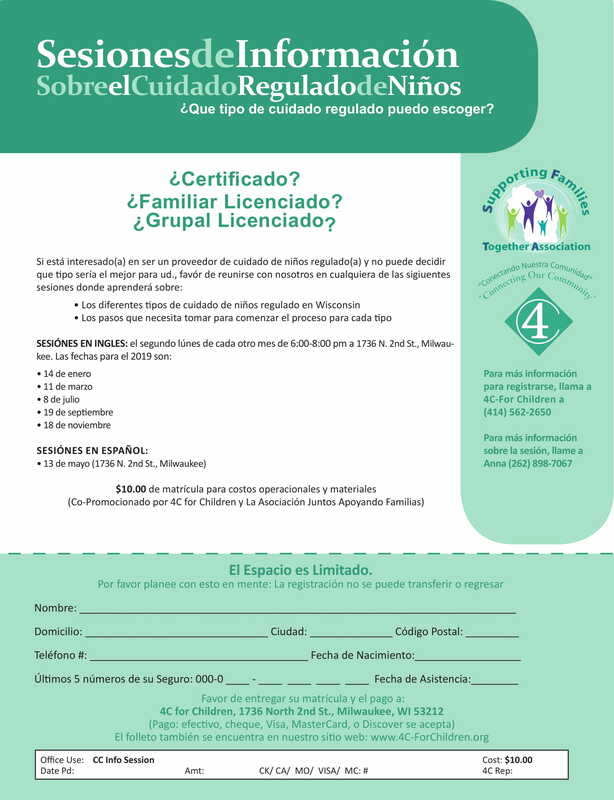 Contact your local child care resource and referral agency for more information or visit the WI Department of Children and Families website. 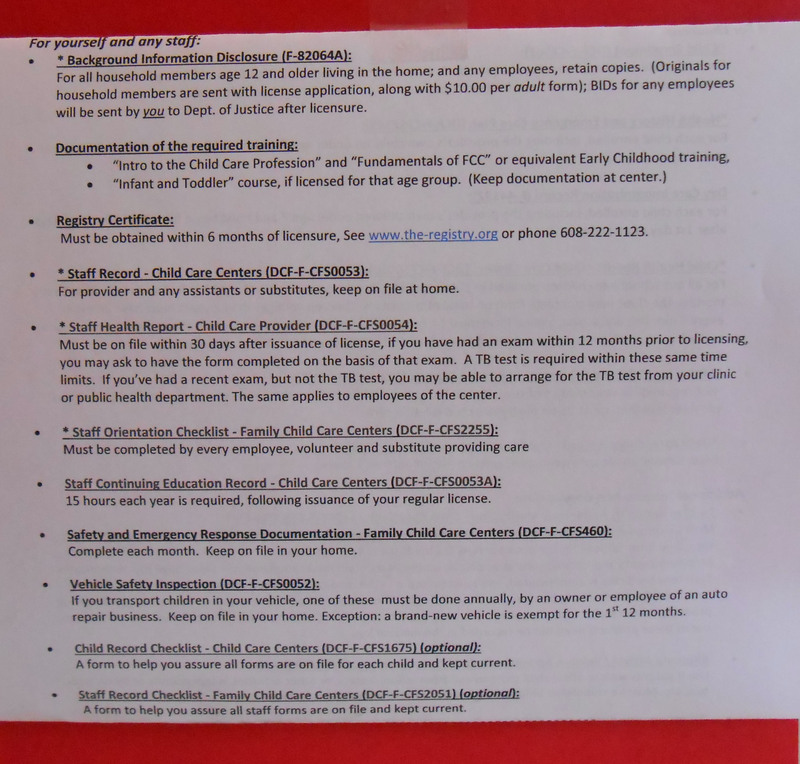 *Please note, if you are starting a child care we have recently received some reports from the field that there are individuals attempting to make child care providers pay to receive Department of Workforce Development (DWD) posters that they say you must have posted in your program. Do NOT pay for these from anyone claiming that you should. 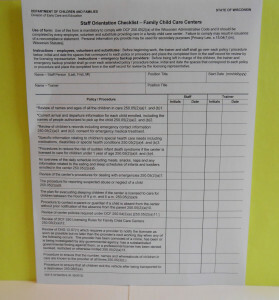 These are not required to be posted by the Department of Children and Families (DCF), and you can check under the DWD requirements to see whether any of them are required to be posted at your program by DWD. If you choose to post some or all of these posters you can access them for free right here. Once the worksheet is received, SFTA will assign a technical consultant to provide you with limited support—free of charge—in the areas of licensing rules and procedures, written policies, and environments. Additional technical consultation may be arranged to support providers in their preparation efforts, for an additional investment. For more information, please ask your technical consultant. For a more detailed outline of the full process to become licensed, visit the WI Department of Children and Families’ Child Care Start-Up Information webpage. For ideas and inspiration, read about Wisconsin child care programs succeeding in YoungStar. 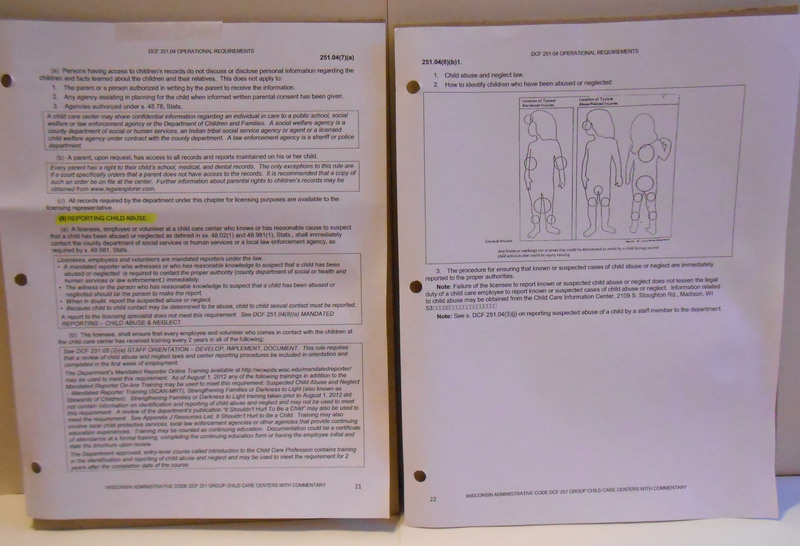 Department of Workforce Development (DWD) Posters: Do NOT pay for these from anyone claiming that you should. 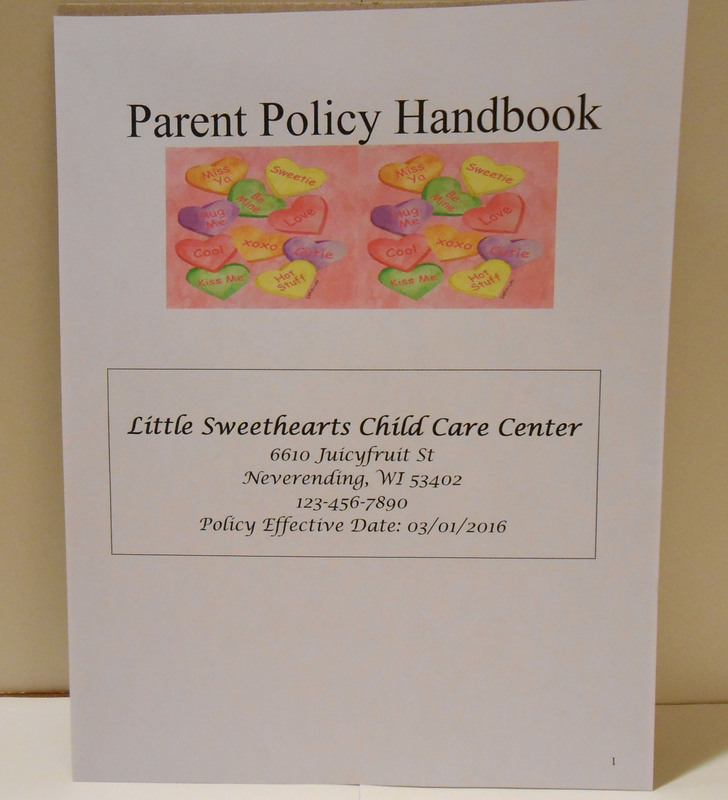 These are not required to be posted by the Department of Children and Families (DCF), however should you choose to post some of them you can access them for free right here. Continuing Education: Family Child Care providers must have at least 15 hours of continuing education each year. Continuing Education Providers and/or staff working more than 20 hours a week must have at least 25 hours of continuing education each year. Providers and/or staff working 20 hours or less a week must have at least 15 hours of continuing education each year. 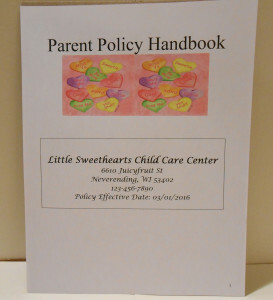 Those working with children under 2 years of age must complete 10 hours of training in infant/toddler care within 6 months of beginning to work with children under 2, in addition to meeting basic entry-level requirements for the position held. 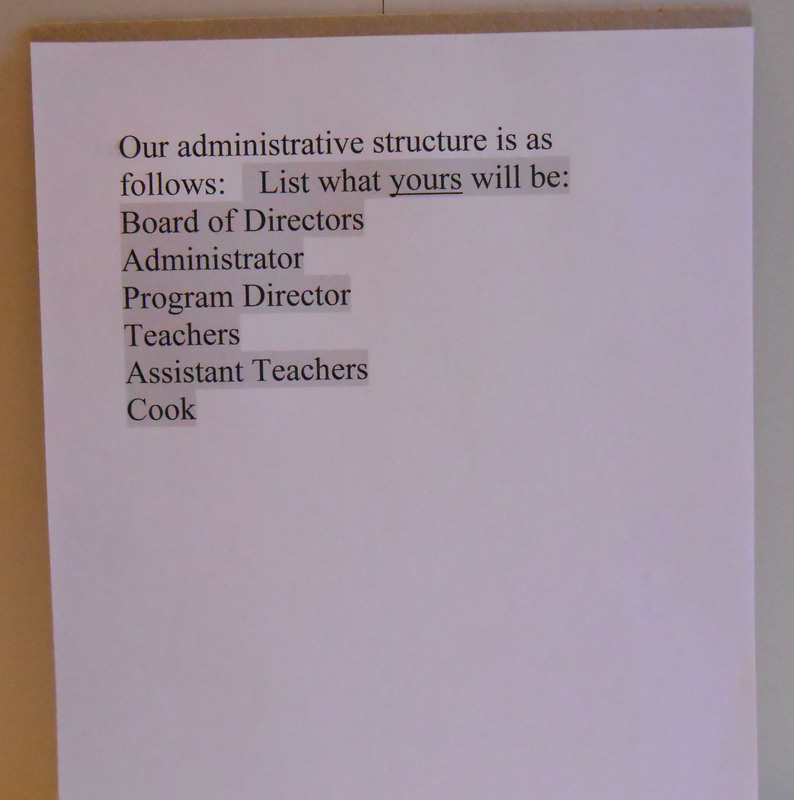 Administrators & Center Directors must obtain 10 hours of training in supervision and personnel management within one year of assuming the position, if s/he has no prior training in these areas. 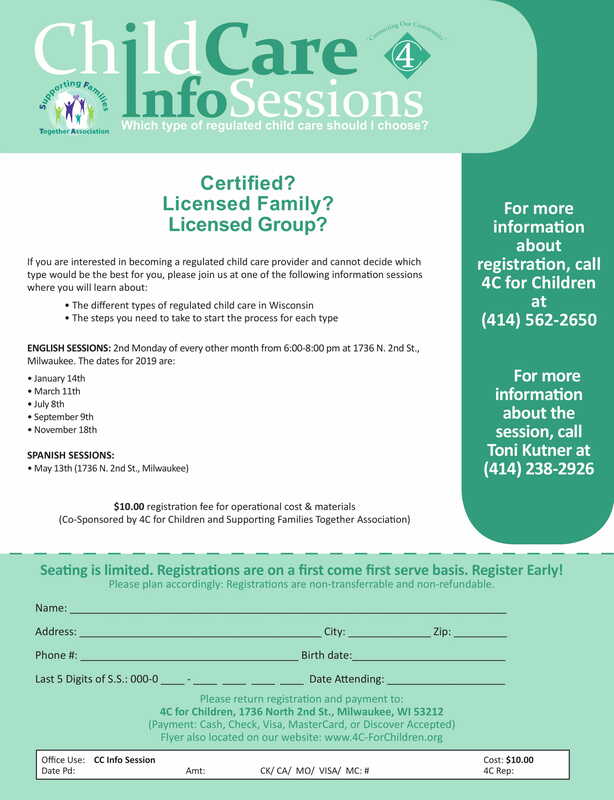 Information about obtaining a child care license. CACFP promotes healthy and nutritious meals for children and adults in day care by reimbursing participating day care operators for their meal costs. 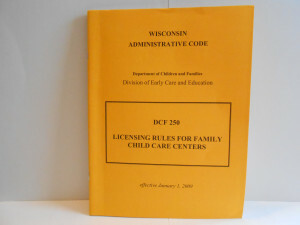 A state funded library of books, videotapes, audiocassettes, articles and brochures on all aspects of child care, and child development in Wisconsin. Most are free; the only cost for borrowed books and tapes is return postage. Access live support regarding your child care business. 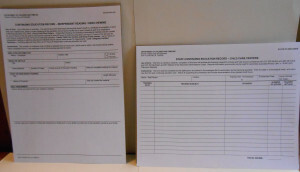 Obtain information about grants and foundations. Small Business Association program; several of these are located around the state. Retired executives offer free counseling to individuals or groups interested in starting a new business. An independent agency of the federal government to aid, counsel, assist and protect the interests of small business concerns, to preserve free competitive enterprise, and to maintain and strengthen the overall economy of our nation. The Department’s primary responsibilities include providing job services, training, and employment assistance to people looking for work. It also works with employers on finding the necessary workers to fill current job openings. See: Unemployment compensation, wages and hours, worker’s compensation, and workplace posters. Wisconsin’s SBDC network consists of twelve service centers and four specialty centers, all located on four-year UW Campuses. Wisconsin Women’s Business Initiative Corporation (WWBIC) An economic development corporation that provides quality business education, technical assistance, and access to capital through their lending programs. YoungStar is a program of the Department of Children and Families created to improve the quality of child care for Wisconsin children.